The official OMB-designated Washington–Baltimore–Northern Virginia, DC–MD–VA–WV combined statistical area, based on the 2000 Census. A general map of the counties that are a part of the area, based on the 1990 Census. 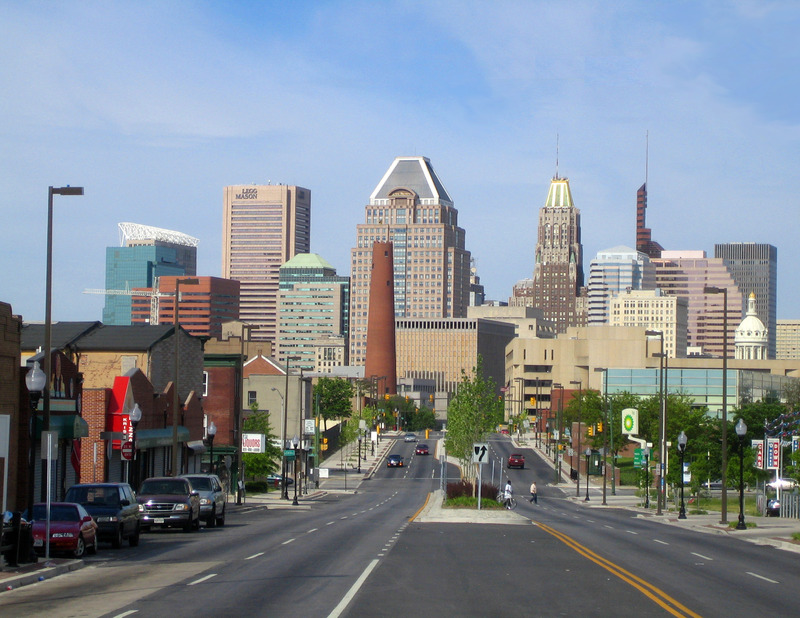 The Baltimore–Washington metropolitan area is a combined statistical area consisting of the overlapping labor market region of the cities of Baltimore, Maryland and Washington, District of Columbia. The region includes Central Maryland, Northern Virginia, two counties in the Eastern Panhandle of West Virginia, and one county in South Central Pennsylvania. It is the most educated, highest-income, and fourth largest combined statistical area in the United States. Officially, the area is designated by the Office of Management and Budget (OMB) as the Washington-Baltimore-Arlington, DC-MD-VA-WV-PA Combined Statistical Area. It is composed primarily of two major metropolitan statistical areas, the Baltimore-Columbia-Towson, MD MSA and the Washington–Arlington–Alexandria, DC–VA–MD–WV MSA. In addition, six other smaller urban areas not contiguous to the main urban area but having strong commuting ties with the main area are also included in the metropolitan area. These are: the Hagerstown-Martinsburg, MD-WV MSA, the Chambersburg-Waynesboro, PA MSA, the Winchester, VA–WV MSA, the California-Lexington Park, MD MSA, the Easton, MD micropolitan statistical area (µSA), and the Cambridge, MD µSA. Some counties and cities are not officially designated by the OMB as members of this metropolitan area, but still consider themselves members anyway. This is mostly due to their proximity to the area, the size of their commuter population, and by the influence of local broadcasting stations. The population of the entire Baltimore–Washington Metroplex as of the Census Bureau's 2012 Population Estimates is 9,331,587. The most populous city is Washington, DC, with a population of 632,323. The most populous county is Fairfax County, Virginia, with a population exceeding 1 million. Founded in 1957, the Metropolitan Washington Council of Governments (MWCOG) is a regional organization of 21 Washington-area local governments, as well as area members of the Maryland and Virginia state legislatures, the U.S. Senate, and the U.S. House of Representatives. MWCOG provides a forum for discussion and the development of regional responses to issues regarding the environment, transportation, public safety, homeland security, affordable housing, community planning, and economic development. The National Capital Region Transportation Planning Board, a component of MWCOG, is the federally-designated Metropolitan Planning Organization for the metropolitan Washington area. Not limited to its proximity to the National Institutes of Health, Maryland's Washington suburbs are a major center for biotechnology. Prominent local biotechnology companies include MedImmune, United Therapeutics, The Institute for Genomic Research, Human Genome Sciences and the Howard Hughes Medical Institute. Many defense contractors are based in the region to be close to the Pentagon in Arlington. Local defense contractors include Lockheed Martin, the largest, as well as Northrop Grumman, General Dynamics, BAE Systems Inc., Computer Sciences Corporation (CSC), Science Applications International Corporation (SAIC), and Orbital Sciences Corporation. ^ "State Totals: Vintage 2012 - U.S Census Bureau". Census.gov. http://www.census.gov/popest/data/state/totals/2012/index.html. Retrieved 2013-06-04. ^ As according to Federal Aviation Administration CY 2011 Enplanement Data, BWI exceeded Dulles by less than 24,000 passengers. As of 2010, however, Dulles has an edge in international traffic. This page uses content from the English language Wikipedia. The original content was at Baltimore–Washington metropolitan area. The list of authors can be seen in the page history. As with this Familypedia wiki, the content of Wikipedia is available under the Creative Commons License.